Stumbling Part Four ~ Signs, Snakes, and Shedding Skin. Stumbling Part 4 ~ Of Snakes, Signs, and Shedding Skin. This past winter I was depressed. Pretty seriously depressed I think, although I was in denial to the degree that I refused to use the “D” word until only recently, and did not seek any medical or psychological help outside of my own resources. And, I might add, the determinedly loving and grounded presence of my wonderful husband. Not sure what I would’ve done without him. I had refused to use the word “depressed” or “depression” because I have this idea that if I label it, or label myself as “depressed”, then I own it, and it makes it not only more “real,” but I risk identifying with it. I didn’t want to become that. In hindsight, as a coach, if I’d had a client presenting as I did, I would’ve been urging them to get some other professional help, as well as working with me on breaking the habits of thought and physiology that contribute to depression and creating something to lift their focus. But for myself… the same reason you shouldn’t be your own lawyer or therapist… we lose objectivity about ourselves, and it is difficult to see the way out alone when you are in such a dark place. Despite all I know, all my studies in coaching, and readings in self-development, I found myself in tears almost daily, for a few months, not for the whole day, but in waves. Sometimes I was just feeling hyper-sensitive to the state of the world and various incidents I would hear about on the news. But mostly it was a result of a downward spiral of negative self-talk, basically carrying a huge load of shame around for not being the “success” I’d imagined I “should’ve” been by now, having passed my 55th birthday in December. I’d had a vision for how my life was supposed to look, and although I’d really abandoned it years ago, I was nevertheless regretting not being “there”. My coaching practice was not where I’d hoped it would be by now, I had a frustrating lack of income, and periodic regrets about not being more conventional and sticking to some job that would’ve offered a pension and all those things I’d imagined in my 20’s as I finished law school. I looked at one of my older brothers, recently retired, government pension from a life-long career… he’s happy, fit, traveling, exercising, having fun. Why did I have to be the “creative” in the family who couldn’t stick to one thing long enough to make something prosperous of it? And who were all these coaches on Facebook or sending me emails (to which I’d foolishly subscribed), telling me about their system for making “Six Figures?” Not that I really believe them, but I couldn’t help but think I should’ve been “more”. Ah yes, I know, I know. 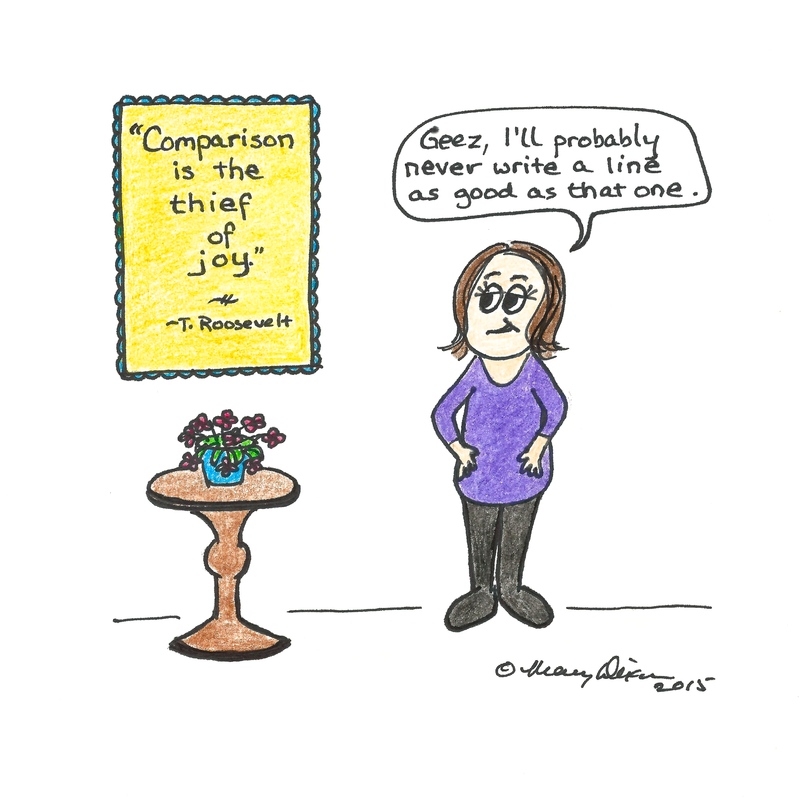 I had once drawn a Mary Doodle cartoon with the Theodore Roosevelt quote: “Comparison is the thief of joy.” Indeed it is. The constant reminders of how I wasn’t as successful as so-and-so and of what a “successful” life is “supposed” to look like (a materialistic point of view), took their toll on my confidence and self-worth. The revelation I’d had in the fall as well, that I wasn’t really congruent in terms of who I was, what my true interests were, and how I was presenting as a coach, also threw me off-kilter. I had discovered that in my quest to look more mainstream in terms of how I coached and what my focus was, I had abandoned a lot of the things that drew me toward coaching in the first place, which was the SOULful part of Soul Coaching®, the guided journey work, the work with cards, signs, and spirit guides, the creation of altars and sacred space. I was confused about what I had to offer. I hadn’t been following my spirit’s calling because I guess I couldn’t really believe that I could do that kind of inner, soulful work with people that I wanted to, ie. that not enough people wanted that. I thought my coaching practice had to look a little more like some therapeutic psychological model, which isn’t necessarily “coaching” anyway. To compound my frustration and fears, we had some big financial challenges this winter, unexpected expenses that kept mounting for treating our elderly cats, several surgeries for our dog Angus’ cancer, and a huge expense for our aging automobile. Combined with a downturn in business for both of us, this added to my feelings that I was not enough, that I needed to be contributing much more to our household. My denial that I was capital “D” Depressed was supported by the fact that I at least was determined to get out of bed, showered, and dressed every day. I still went to town for groceries, wrote a few blogs and newsletters, managed to run my winter coaching class, had some dinner guests over and talked and laughed, walked the dogs, and did the laundry. I was functional, but very, very tired. And I cried… a lot, mostly out of sight of my husband. And I had some really dark thoughts that scared me. And I would spiral downward because then I would think, “See?? What kind of coach am I that I feel this way?” And then my shame would feed on itself and take me even lower. Maybe menopause had a big part to play, messing with my hormones with all the attendant mood swings. But nobody knew about my sadness except my hubby, and he didn’t see the full extent of my pain. Eventually, when it became too much, I was able to simply tell him, and being able to be totally upfront about how I was feeling helped me through the worst of it. He didn’t treat me like I was the crazy person I felt I was. He was a rock. He knew the only way out was through it, and was willing to hang in there with me all the way. But there were other things too that started shifting everything for me, or, I like to think, that I started to shift. In May we were scheduled to have a booth at the local mind, body, spirit fair, and in my enthusiasm before I went south into my “spiral of despair”, I had committed to giving a talk at said fair. As the date approached, I started experiencing anxiety, not only regarding my own concern about my mental state, but about the fact that I, a life coach, was supposed to give a talk teaching or inspiring others when I was still in the throes of my own deep pain and confusion. Who the heck was I to offer any help on happier living when I had fallen into this hole? Indeed that’s one of the biggest hang-ups of many coaches…the “Who am I to coach anyone…?” question. Coaching isn’t the same as advising or mentoring (although that may be a part of it), but it helps to be congruent in your life about what you offer in your work. I certainly wouldn’t offer to mentor or teach anyone about running a profitable business! But often we do “teach what we most need to learn” (that’s a broad “we,” not coaches in particular), and sometimes it is something we already know very well but have simply gotten off course and need to find our way back. We don’t have to be “perfect” on all levels of our life to be an effective coach to others. But we do need to be always aware and doing our own work in order to stay in alignment with who we are and what we project and offer. According to my journal, on Mother’s Day, a week before the fair, I took the dogs on our usual walk to my sacred stone circle at the back of our woods. I had started the return toward home but then went back again to the circle, feeling suddenly quite overwhelmed with tears, feeling bad about myself once more. I think I spent an hour or so there, asking for guidance, praying. Worried that Edward would wonder what had happened to me, I finally pulled myself together and headed home. On the way I stopped by the pond, walked around the small stone circle I have there, saw a turtle slip into the water, then re-stacked some of my rock piles along the trail. Suddenly something moved in the grass in front of me. I stopped. It stopped. It was a handsome garter snake, about two feet long. Luckily the dogs seemed not to notice him. I said, “Oh! Hello!” He just stayed there at the edge of the path, flicking his red tongue at me as I talked to him. I had my gardening gloves on, so I took a chance and gently picked him up to have a closer look. Not wanting to stress him I put him back down quickly. I had rarely seen a snake on the trail and certainly not one that had stopped and allowed me that close. The next day on the dog walk I saw him again on my way down. At least, I think it was the same snake, he looked the same kind and size, although further down the trail. Alfie had noticed him first and before the dogs could get too close I tied her and Angus to a tree. This time I had my camera with me, and again the snake stopped and let me get really close. I got down on my knees and elbows to take some photos, then thanked him as we continued on. However on the way back, although he had slithered off the trail several feet when I had taken the pictures, there he was, back again in the middle of the path. This time Angus saw him first and pounced as I shouted at him “NO!” Snake slid safely away. Heading home I realized I had encountered him three times in 24 hours. It can be considered a “sign” from Spirit if you have such an unusual experience or see a particular animal three times. When we do shamanic journeys we are told that the animal we encounter three times in our first journey is likely our power animal, especially if they acknowledge us or stand out in some way. The fact that he actually stopped and I was able to pick him up and later photograph him, seemed pretty significant to me, and I thought perhaps I was receiving a new power animal. In the book for the “Medicine Cards” oracle deck by Jamie Sams and David Carson (St. Martin’s Press), Snake medicine is “Transmutation”. Transmutation is basically the changing of one thing into another, something bad to good, as in alchemy, turning lead into gold. In the medicine of some indigenous peoples it is about turning poison into healing. In light of my encounter with snake and these words, I asked myself, “What is my poison and how can I turn that into healing?” In my habit of second-guessing, snake’s medicine was not quite enough for me. I decided I had also to consult some other oracle cards for guidance on what to do about my upcoming talk. I consulted the “Soul Lessons and Soul Purpose” card deck by Sonia Choquette (Hay House) and got the cards “Become a clear channel” and “Bust out of your cocoon”. The guidebook for these said the “clear channel” card was about clearing “mental debris, confusion, psychic clutter” to “be a clear channel for myself and Divine Spirit”. And the one about “busting out” said one phase of my life was ending and a new one beginning (a message I’d received several time over the course of the winter). Hmmm..sounds remarkably like the shedding of snake’s skin…my old identity…and transmutation…turning fear into action. Once again the signs and messages coincided, and my takeaway was that my “safe but nonproductive” work as I’d been offering it was something to release…to shed like a snake skin or bust out of the cocoon of that phase of my life, where I’d been trying to be someone I was not again, and to become a clear channel for Spirit. I had to have a change in consciousness, maybe an uncomfortable phase, in order to let go of a past identity that wasn’t serving my spirit. The transmutation? Turning the fear (of being unconventional as a more soul and spirit-focused coach) into action. I knew I had to take action and create something. And how would I turn the “poison into healing” right now? By telling my story about this very situation, about how I could turn it around from being depressed and despairing and offer up creative action to heal both myself and others in a similar situation. So I started writing my speech for the healing fair…on the Friday, the day before my talk. And as I created, my mood improved and more clarity emerged about what I was doing, and that inspired the writing. The action of keeping my commitment to the fair and making something that could help others, became for me a magical process…. heavy magic, as the cards said, creating a change in consciousness. One other thing had happened. On the Thursday I ran into a friend at the farmers’ market, where I had just started a part-time job selling wine for a local vineyard. It was great for me to get out into the community doing something fun, talking to lots of people, selling a great product, and also bringing in a little additional revenue to the household. Just the commitment to doing that weekly also helped me turn things around and made me feel useful and outward-focused. My friend mentioned something to me about a comment I had made on her Facebook post…it had made me think about my struggles of the winter, and when she inquired about my comment I started to tear-up, and told her about what had been going on with me. I also told her of my need to get a presentation together for the fair and what I was thinking about writing. She suggested I incorporate some of my “Mary Doodle” doodles in my talk to illustrate it, especially since I had done a presentation about the creation of Mary Doodle the previous year. I thought if I could make the time, I would draw on a big flip chart to illustrate each of the main points in the talk, which was becoming how I got myself out of my dark hole. But my friend Karen said, “But you have to do one of the despairing, depressed you too.” Mary Doodle’s misery. That could be challenging. After writing my speech on the Friday I stayed up until 2:30 a.m. doodling….including a drawing of Mary Doodle with her darkest thoughts. The next day in the noisy conference room I managed to keep the rapt attention of around 10 or 12 people who’d stopped by for my talk, including at least 4 who stood at the back of my audience for the whole 45-minute presentation. I received some great feedback. By sharing my story and my perspective on getting out of that situation, I turned my poison into my own healing, and possibly some healing for those in attendance. Perhaps not surprisingly, I have also begun attracting clients and potential clients, who resonate with the kind of spirit-based work I really love to do. In fact, as a result of a client I met at that healing fair and another who called me based on my last blog entry here, I have created a new program for the two of them, and hopefully for others in the future, which is in progress now. It is an experiential journey over eight sessions intended to be an introduction to the ideas and many of the processes which have been personally helpful to me in connecting with Spirit and with my Soul or Higher Self. It was exactly what they were looking for. The fact that both of these people could only fit in their first appointments with me on the very same day in back-to-back sessions was a delightful synchronicity that helped confirm for me I was on the right track in getting back to offering the work that is closest to my heart. But my story of Snake doesn’t end there! We have a large garden we created several years ago which had been our “Medicine Wheel” garden. It is 32 feet in diameter on the inside of the circle, ringed with lavender plants (originally there were 32 lavender plants). Inside the circle we planted beds in 4 quadrants to represent the colours of the Four Directions as conceived of by certain native American tribes, and we had paths running north/south and east/west, as well as a kind of zigzag path through the beds. It was lovely at its peak, but due to it’s location in a very dry spot far from our water hoses, it became a real chore to maintain. The lavender did well but the other plants suffered and I gave up and let it get weedy. But we still had a vision for that spot as some kind of healing space. So finally last month Edward scooped out the interior plants with the tractor, leaving the lavender ring, and we found a design for a small three-circuit labyrinth. We decided we would fill the centre with gravel and mark the pathway with larger rocks, keeping it simple to maintain. I felt terrible to have killed a snake which I felt had just become my new power animal and who’s medicine had helped me so much. I wondered what meaning do I make of this? Edward said he had just put the snake to the side of the shed so I went down to find it. It was the same kind of garter snake I’d found in the woods. His form and skin was still intact.He was quite beautiful, with a little green tinge that the other snake did not have. I asked myself, if Snake medicine is to turn poison into healing, how can I turn this situation around? Perhaps Snake is a sacrifice to bring healing to the labyrinth. We want it to be a healing space after all. So I immediately chose to bless the space with an empowering meaning. I scooped a small hole in the earth in the very centre of the labyrinth-to-be. I picked daisies and some artemesia and lavender to make a bed for the snake and coiled him gently on top. I surrounded him with some stones, some amethyst, for healing and connection to Spirit, some red granite for grounding the energy, red jasper for grounding, healing, and emotional stability, and some clear quartz underneath him to amplify the healing energy of my intentions and of the other crystals. I brought some sage for smudge from my office and burned it and smudged the snake, asking forgiveness for killing it, giving thanks to Snake for his medicine, and asking that the gift of transmutation and healing be brought to the labyrinth. I then proceeded to walk around in back and forth rings as if the labyrinth paths were already there, offering the smoke to bless and purify the space and make it a place of healing for all. Then I covered the snake with some handfuls of sand, pulled the weed mat over it, and placed a smooth flat rock on top of him and a wild pink rose on top of that, for love. The next day the gravel was delivered. The day after we‘d leveled the gravel I was gathering more rocks from the edges of our property and piling them at the entrance to the circle to use to mark the path. One pile had already been there for a couple of days, but I started laying them out using the ones I had just dumped out of the wheelbarrow. The snake moved around a large rock at the entrance to the inside of the lavender bed (I was on the outside of it) and stopped, raised his head above the earth to see us and flicked his red tongue. I was so excited! 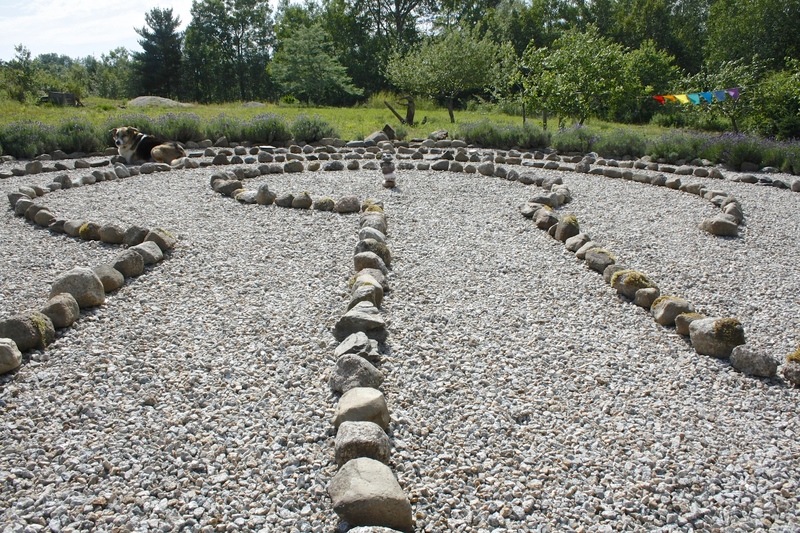 In my meaning-making mind I chose to see this as a sign that Snake was indeed blessing the labyrinth with his presence. I thanked him for showing up while I laid the path, and as I spoke I moved gently over to my right to get a little closer and knelt in the centre of the entrance, with the snake to my left now. Unbelievably, Angus did not pounce. And then, the snake turned right around and moved across the entrance, curling itself against my bare knees as it moved across the path to disappear under a plant to my right. I was delighted to have contact! I guess there must be a few good-sized garter snakes around here this summer, enjoying the heat. Edward says he’s seen some others in the pile of old lumber not far from the labyrinth, and there’s been at least one in the greenhouse which was curled up in a plant pot for a while. He also found a snake skin that had been shed there. So I pop into the greenhouses myself to have a peek now and then, to see if I can spot one. The other day I also found a snake skin near the entrance of the large greenhouse and minutes later found another in the small greenhouse, right where I’d seen a snake the day before. Seemed as if he’d used a pile of bird netting as a tool to help pull off his skin, as it was trapped inside the net. Once completed, I noticed that the labyrinth itself is somewhat snake-like…not a proper coil or spiral, but having snake-like curves. As I walk it daily, and have witnessed the immediate insights it has already provided for my clients who’ve walked it also, I feel the healing is happening, for me and for others. I will write another post soon with the main content of the talk I did at the fair and the accompanying doodles, to describe the eight steps that seemed influential in my pulling myself out of my downward spiral. But for now I would say that ultimately it was a matter not only of those steps, which included creating and contributing to others as well as reconnecting with my spiritual guidance. But it was also a real letting go, of my fear of being seen and judged for who I really am. I did shed my skin…and not just the skin of the person who was depressed and had struggled greatly despite all my training and advantages. I also shed the skin of the person who was fearful of being seen as embracing the metaphysical, the mysteries of things like signs and synchronicities, one who creates my own ceremonies and rituals to celebrate and honour my intentions, my gratitude, and prayers, and who makes meaning that ultimately is proving to empower myself and others. I used to think that becoming one’s authentic self was like peeling the layers of an onion, always another layer to reveal what’s inside. While not a bad analogy, as you peel those layers, the onion gets smaller. But if you become like Snake, you shed your skin as you grow, you become more and more of yourself, and cast off what no longer fits. I think I like that version better. My authentic self is not some static thing that was once covered up and is being revealed. It is constantly evolving, growing, and changing, repeatedly bursting out of a skin that’s too tight, like Snake. ← Stumbling Part Three ~ Messages from Spirit and The Healing Power of Ceremony. It takes much strength and honesty to share the struggles you’ve recently experienced. Please know these are but two of the very qualities that so endear you to me. I admire your reformative spirit, but especially because you use it to help others along in our (sometimes stumbling) journeys. Thank you so much Raylene, I really appreciate this. Hi Whitney, thanks so much for taking the time to read this and for your lovely comments. Much appreciated!